I'm officially all worded out. 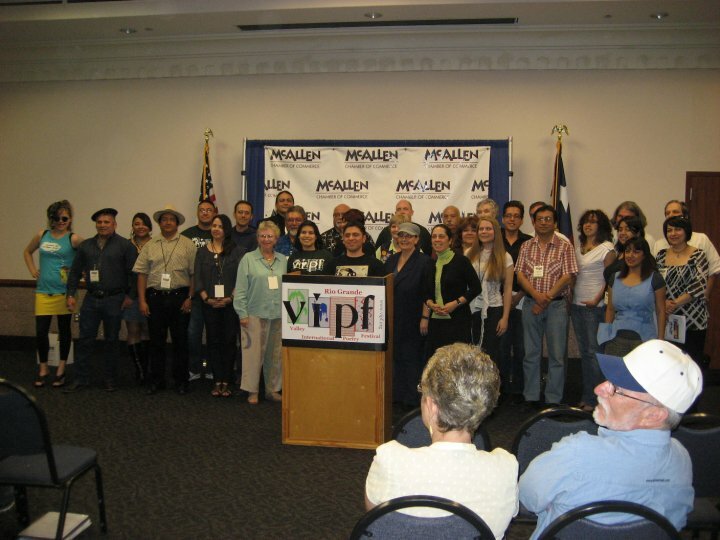 There we are... at the Poetry Pachanga! What an incredible weekend. 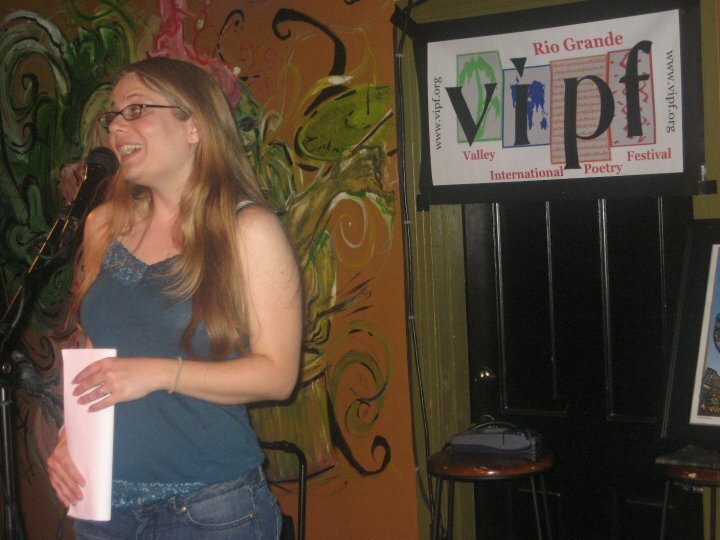 I had such a great time participating in the Valley International Poetry Festival. Last night was the big finale at the McAllen Chamber of Commerce. I sat at Amalia Ortiz's table for dinner! When am I going to get a chance to chat over a glass of wine with her?? Why... next year of course at VIPF 2011! LoL. No but seriously, great night, wonderful weekend. 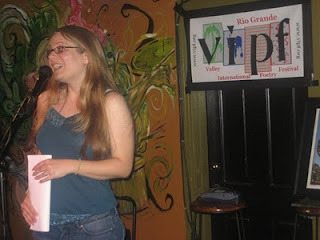 Last night I think the audience was really digging my poem! I read "The Common Denominator" and proclaimed that I AM A BORDER WOMAN! Yes, with my blond hair and blue eyes and guerita midwest accent, I am a border woman! :-P That's what my chapbook speaks to, anyway. The only disappointing thing about last night was that i didn't sell ANY of my chapbooks. Boohoo. LoL it was pretty funny though, because by the end of the night there was some pretty sweeping drunkenness. That's what happens when they have a bottle of tequila next to the mic. I, of course, behaved. I did miss church this morning, and had a real hankering for strong black coffee when I woke up, though. Anyway... here are a few pictures from the poetry slam at Jitterz. That's my professor, Emmy, introducing my chapbook, Among the Mariposas. She said that the MFA program is so proud of me. AWWW :) That made me feel all warm and fuzzy inside. 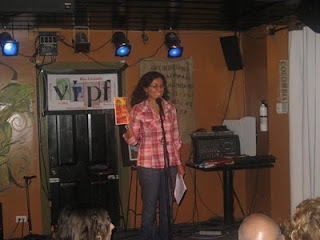 << Here's me reading at Jitterz! I sure was having a good time. Now I have a LOT of writing to do. I took a bit of a hiatus from writing poetry the last week or so and got REALLY behind on assignments for class. No kidding, I have to write seven new poems before Thursday? Can I do it? Aye. Not only that, but I need to prepare for the Wild Tongues Symposium on Saturday. I'm giving a talk about my chapbook there, and I haven't even thought about what I'm going to say. Should I be nervous? Poets don't get nervous! There's so much more that I want to say, but alas, procrastination must cease. Time to get to work.